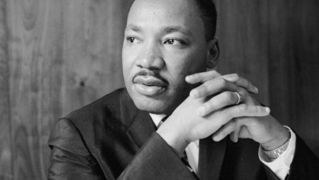 SPECIAL: Dr. Martin Luther King, Jr. in His Own Words | Democracy Now! AMY GOODMAN: Today is a federal holiday that honors Dr. Martin Luther King. He was born January 15th, 1929. He was assassinated April 4th, 1968, at the Lorraine Motel in Memphis, Tennessee. He was just 39 years old. More than four decades after Dr. King’s death, Barack Obama took his oath of office to become the 44th president of the United States and the first African-American president in U.S. history. PRESIDENT BARACK OBAMA: This is the meaning of our liberty and our creed, why men and women and children of every race and every faith can join in celebration across this magnificent Mall, and why a man, whose father less than 60 years ago might not have been served at a local restaurant, can now stand before you to take a most sacred oath. AMY GOODMAN: Obama accepted the Democratic Party nomination on the 45th anniversary of Dr. King’s “I Have a Dream” speech. AMY GOODMAN: While Dr. King is primarily remembered as a civil rights leader, he also championed the cause of the poor and organized the Poor People’s Campaign to address issues of economic justice. Dr. King was also a fierce critic of U.S. foreign policy and the Vietnam War. REV. DR. MARTIN LUTHER KING, JR.: After 1954, they watched us conspire with Diem to prevent elections which could have surely brought Ho Chi Minh to power over the united Vietnam, and they realized they had been betrayed again. When we ask why they do not leap to negotiate, these things must be remembered. Also, it must be clear that the leaders of Hanoi considered the presence of American troops in support of the Diem regime to have been the initial military breach of the Geneva Agreements concerning foreign troops. And they remind us that they did not begin to send troops in large numbers and even supplies into the South, until American forces had moved into the tens of thousands. Hanoi remembers how our leaders refused to tell us the truth about the earlier North Vietnamese overtures for peace, how the president claimed that none existed when they had clearly been made. Ho Chi Minh has watched as America has spoken of peace and built up its forces, and now he has surely heard the increasing international rumors of American plans for an invasion of the North. He knows the bombing and shelling and mining we are doing are part of traditional pre-invasion strategy. Perhaps only his sense of humor and of irony can save him when he hears the most powerful nation of the world speaking of aggression as it drops thousands of bombs on a poor, weak nation more than 8,000 miles away from its shores. At this point, I should make it clear that while I have tried in these last few minutes to give a voice to the voiceless in Vietnam and to understand the arguments of those who are called “enemy,” I am as deeply concerned about our own troops there as anything else, for it occurs to me that what we are submitting them to in Vietnam is not simply the brutalizing process that goes on in any war where armies face each other and seek to destroy. We are adding cynicism to the process of death, for they must know after the short period there that none of the things we claim to be fighting for are really involved. Before long, they must know that their government has sent them into a struggle among Vietnamese, and the more sophisticated surely realize that we are on the side of the wealthy and the secure, while we create a hell for the poor. Somehow this madness must cease. We must stop now. I speak as a child of God and brother to the suffering poor of Vietnam. I speak for those whose land is being laid waste, whose homes are being destroyed, whose culture is being subverted. I speak for the poor of America, who are paying the double price of smashed hopes at home and death and corruption in Vietnam. I speak as a citizen of the world, for the world as it stands aghast at the path we have taken. I speak as one who loves America, to the leaders of our own nation: The great initiative in this war is ours; the initiative to stop it must be ours. This is the message of the great Buddhist leaders of Vietnam. Recently one of them wrote these words, and I quote: “Each day the war goes on, the hatred increases in the heart of the Vietnamese and in the hearts of those of humanitarian instinct. The Americans are forcing even their friends into becoming their enemies. It is curious that the Americans, who calculate so carefully on the possibilities of military victory, do not realize that in the process they are incurring deep psychological and political defeat. The image of America will never again be the image of revolution, freedom and democracy, but the image of violence and militarism,” unquote. If we continue, there will be no doubt in my mind and in the mind of the world that we have no honorable intentions in Vietnam. If we do not stop our war against the people of Vietnam immediately, the world will be left with no other alternative than to see this as some horrible, clumsy and deadly game we have decided to play. In order to atone for our sins and errors in Vietnam, we should take the initiative in bringing a halt to this tragic war and set a date that we will remove all foreign troops from Vietnam in accordance with the 1954 Geneva Agreement. Part of our ongoing — part of our ongoing commitment might well express itself in an offer to grant asylum to any Vietnamese who fears for his life under the new regime, which included the Liberation Front. Then we must make what reparations we can for the damage we have done. We must provide the medical aid that is badly needed, making it available in this country, if necessary. Meanwhile — meanwhile, we in the churches and synagogues have a continuing task: While we urge our government to disengage itself from a disgraceful commitment, we must continue to raise our voices and our lives if our nation persists in its perverse ways in Vietnam. We must be prepared to match actions with words by seeking out every creative method of protest possible. These are the times for real choices and not false ones. We are at the moment when our lives must be placed on the line if our nation is to survive its own folly. Every man of humane convictions must decide on the protest that best suits his convictions, but we must all protest. Now, there is something seductively tempting about stopping there and sending us all off on what in some circles has become a popular crusade against the war in Vietnam. I say we must enter that struggle, but I wish to go on now to say something even more disturbing. The war in Vietnam is but a symptom of a far deeper malady within the American spirit, and if we ignore this sobering reality —- and if we ignore this sobering reality, we will find ourselves organizing clergy— and laymen-concerned committees for the next generation. They will be concerned about Guatemala and Peru. They will be concerned about Thailand and Cambodia. They will be concerned about Mozambique and South Africa. We will be marching for these and a dozen other names and attending rallies without end, unless there is a significant and profound change in American life and policy. So such thoughts take us beyond Vietnam, but not beyond our calling as sons of the living God. Increasingly, by choice or by accident, this is the role our nation has taken, the role of those who make peaceful revolution impossible by refusing to give up the privileges and the pleasures that come from the immense profits of overseas investments. I am convinced that if we are to get on the right side of the world revolution, we as a nation must undergo a radical revolution of values. We must rapidly begin — we must rapidly begin the shift from a thing-oriented society to a person-oriented society. When machines and computers, profit motives and property rights are considered more important than people, the giant triplets of racism, extreme materialism and militarism are incapable of being conquered. A true revolution of values will lay a hand on the world order and say of war, “This way of settling differences is not just.” This business of burning human beings with napalm, of filling our nation’s homes with orphans and widows, of injecting poisonous drugs of hate into the veins of peoples normally humane, of sending men home from dark and bloody battlefields physically handicapped and psychologically deranged, cannot be reconciled with wisdom, justice and love. A nation that continues year after year to spend more money on military defense than on programs of social uplift is approaching spiritual death. AMY GOODMAN: Dr. Martin Luther King, April 4th, 1967 at Riverside Church in New York, explaining why he opposed the war in Vietnam. We’ll come back to this speech and then play another. You can get a copy of our show at democracynow.org. Today, Dr. Martin Luther King, in his own words. Back in a minute. AMY GOODMAN: Mahalia Jackson, “Take My Hand, Precious Lord,” Dr. King’s favorite song. This is Democracy Now!, democracynow.org, the War and Peace Report. I’m Amy Goodman, as we return to Dr. Martin Luther King’s speech “Beyond Vietnam.” It was April 4th, 1967 at Riverside Church in New York. REV. DR. MARTIN LUTHER KING, JR.: These are revolutionary times. All over the globe men are revolting against old systems of exploitation and oppression, and out of the wombs of a frail world new systems of justice and equality are being born. The shirtless and barefoot people of the land are rising up as never before. “The people who sat in darkness have seen a great light.” We in the West must support these revolutions. A genuine revolution of values means, in the final analysis, that our loyalties must become ecumenical rather than sectional. Every nation must now develop an overriding loyalty to mankind as a whole in order to preserve the best in their individual societies. This call for a worldwide fellowship that lifts neighborly concern beyond one’s tribe, race, class and nation is in reality a call for an all-embracing and unconditional love for all mankind. This oft-misunderstood, this oft-misinterpreted concept, so readily dismissed by the Nietzsches of the world as a weak and cowardly force, has now become an absolute necessity for the survival of man. Let us hope that this spirit will become the order of the day. We can no longer afford to worship the god of hate or bow before the altar of retaliation. The oceans of history are made turbulent by the ever-rising tides of hate. History is cluttered with the wreckage of nations and individuals that pursued this self-defeating path of hate. As Arnold Toynbee says, “Love is the ultimate force that makes for the saving choice of life and good against the damning choice of death and evil. Therefore the first hope in our inventory must be the hope that love is going to have the last word,” unquote. We are now faced with the fact, my friends, that tomorrow is today. We are confronted with the fierce urgency of now. In this unfolding conundrum of life and history, there is such a thing as being too late. Procrastination is still the thief of time. Life often leaves us standing bare, naked and dejected with a lost opportunity. The “tide in the affairs of men” does not remain at the flood; it ebbs. We may cry out desperately for time to pause in her passage, but time is adamant to every plea and rushes on. Over the bleached bones and jumbled residues of numerous civilizations are written the pathetic words: “Too late.” There is an invisible book of life that faithfully records our vigilance or our neglect. Omar Khayyam writes, “The moving finger writes, and having writ moves on…” We still have a choice today: nonviolent coexistence or violent co-annihilation. We must move past indecision to action. We must find new ways to speak for peace in Vietnam and justice throughout the developing world, a world that borders on our doors. If we do not act, we shall surely be dragged down the long dark and shameful corridors of time reserved for those who possess power without compassion, might without morality, and strength without sight. Now, let us begin. Now, let us rededicate ourselves to the long and bitter — but beautiful — struggle for a new world. This is the calling of the sons of God, and our brothers wait eagerly for our response. Shall we say the odds are too great? Shall we tell them the struggle is too hard? Will our message be that the forces of American life militate against their arrival as full men, and we send our deepest regrets? Or will there be another message, of longing, of hope, of solidarity with their yearnings, of commitment to their cause, whatever the cost? The choice is ours, and though we might prefer it otherwise, we must choose in this crucial moment of human history. AMY GOODMAN: Dr. Martin Luther King, Jr., April 4th, 1967, at Riverside Church in New York, explaining why he opposed the war in Vietnam, the speech delivered exactly a year to the day before he was assassinated at the Lorraine Motel in Memphis, Tennessee on April 4th, 1968. REV. DR. MARTIN LUTHER KING, JR.: And you know, if I were standing at the beginning of time, with the possibility of taking a kind of general and panoramic view of the whole of human history up to now, and the Almighty said to me, “Martin Luther King, which age would you like to live in?” I would take my mental flight by Egypt and I would watch God’s children in their magnificent trek from the dark dungeons of Egypt through — or rather across the Red Sea, through the wilderness on toward the promised land. And in spite of its magnificence, I wouldn’t stop there. I would go on, even to the great heyday of the Roman Empire, and I would see developments around there, through various emperors and leaders. But I wouldn’t stop there. I would even come up to the day of the Renaissance and get a quick picture of all that the Renaissance did for the cultural and aesthetic life of man. But I wouldn’t stop there. I would even go by the way that the man for whom I am named had his habitat. And I would watch Martin Luther as he tacked his 95 theses on the door at the church of Wittenberg. But I wouldn’t stop there. I would come on up even to 1863 and watch a vacillating president by the name of Abraham Lincoln finally come to the conclusion that he had to sign the Emancipation Proclamation. But I wouldn’t stop there. I would even come up to the early ’30s and see a man grappling with the problems of the bankruptcy of his nation and come with an eloquent cry that we have nothing to fear but fear itself. But I wouldn’t stop there. Now that’s a strange statement to make, because the world is all messed up. The nation is sick. Trouble is in the land; confusion all around. That’s a strange statement. But I know, somehow, that only when it is dark enough can you see the stars. And I see God working in this period of the 20th century in a way that men, in some strange way, are responding. I can remember — I can remember when Negroes were just going around, as Ralph has said, so often scratching where they didn’t itch and laughing when they were not tickled. But that day is all over. We mean business now, and we are determined to gain our rightful place in God’s world. And that’s all this whole thing is about. We aren’t engaged in any negative protest and in any negative arguments with anybody. We are saying that we are determined to be men. We are determined to be people. We are saying — we are saying that we are God’s children. And if we are God’s children, we don’t have to live like we are forced to live. Now, what does all of this mean in this great period of history? It means that we’ve got to stay together. We’ve got to stay together and maintain unity. You know, whenever Pharaoh wanted to prolong the period of slavery in Egypt, he had a favorite, favorite formula for doing it. What was that? He kept the slaves fighting among themselves. But whenever the slaves get together, something happens in Pharaoh’s court, and he cannot hold the slaves in slavery. When the slaves get together, that’s the beginning of getting out of slavery. AMY GOODMAN: Dr. Martin Luther King, April 3rd, 1968, the night before he was assassinated. We’ll come back to this speech in Memphis, Tennessee in a minute. AMY GOODMAN: Nina Simone singing “Why? (The King of Love Is Dead)” This is Democracy Now!, democracynow.org, The War and Peace Report. I’m Amy Goodman, as we continue with Dr. King’s speech the night before he was assassinated, April 3rd, 1968. It was a rainy night in Memphis, Tennessee. Bull Connor next would say, “Turn the fire hoses on.” And as I said to you the other night, Bull Connor didn’t know history. He knew a kind of physics that somehow didn’t relate to the transphysics that we knew about. And that was the fact that there was a certain kind of fire that no water could put out. And we went before the fire hoses; we had known water. If we were Baptist or some other denominations, we had been immersed. If we were Methodist and some others, we had been sprinkled, but we knew water. That couldn’t stop us. And we just went on before the dogs, and we would look at them; and we’d go on before the water hoses, and we would look at it. And we’d just go on singing, “Over my head I see freedom in the air.” And then we would be thrown in the paddy wagons, and sometimes we were stacked in there like sardines in a can. And they would throw us in, and old Bull would say, “Take ’em off,” and they did. And we would just go on in the paddy wagon singing, “We Shall Overcome.” And every now and then we’d get in jail, and we’d see the jailers looking through the windows being moved by our prayers and being moved by our words and our songs. And there was a power there which Bull Connor couldn’t adjust to, and so we ended up transforming Bull into a steer, and we won our struggle in Birmingham. Now, let me say, as I move to my conclusion, that we’ve got to give ourselves to this struggle until the end. Nothing would be more tragic than to stop at this point in Memphis. We’ve got to see it through. And when we have our march, you need to be there. If it means leaving work, if it means leaving school, be there. Be concerned about your brother. You may not be on strike. But either we go up together, or we go down together. Let us develop a kind of dangerous unselfishness. One day a man came to Jesus, and he wanted to raise some questions about some vital matters of life. At points he wanted to trick Jesus and show him that he knew a little more than Jesus knew and throw him off base. Now, that question could have easily ended up in a philosophical and theological debate. But Jesus immediately pulled that question from mid-air and placed it on the dangerous curve between Jerusalem and Jericho. And he talked about a certain man, who fell among thieves. You remember that a Levite and a priest passed by on the other side. They didn’t stop to help him. And finally a man of another race came by. He got down from his beast, decided not to be compassionate by proxy. But he got down with him, administered first aid and helped the man in need. Jesus ended up saying, this was the good man, this was the great man, because he had the capacity to project the “I” into the “thou” and to be concerned about his brother. Now, you know we use our imagination a great deal to try to determine why the priest and the Levite didn’t stop. At times we say they were busy going to a church meeting, an ecclesiastical gathering, and they had to get on down to Jerusalem so they wouldn’t be late for their meeting. At other times we would speculate that there was a religious law that “One who was engaged in religious ceremonials was not to touch a human body 24 hours before the ceremony.” And every now and then we begin to wonder whether maybe they were not going down to Jerusalem — or down to Jericho, rather, to organize a Jericho Road Improvement Association. That’s a possibility. Maybe they felt that it was better to deal with the problem from the causal root, rather than to get bogged down with an individual effect. That’s the question before you tonight, not: “If I stop to help the sanitation workers, what will happen to my job?” not: “If I stop to help the sanitation workers, what will happen to all of the hours that I usually spend in my office every day and every week as a pastor?” The question is not: “If I stop to help this man in need, what will happen to me?” The question is: “If I do not stop to help the sanitation workers, what will happen to them?” That’s the question. You know, several years ago, I was in New York City autographing the first book that I had written. And while sitting there autographing books, a demented black woman came up. The only question I heard from her was: “Are you Martin Luther King?” And I was looking down writing, and I said, “Yes.” And the next minute I felt something beating on my chest. Before I knew it, I had been stabbed by this demented woman. I was rushed to Harlem Hospital. It was a dark Saturday afternoon. And that blade had gone through, and the x-rays revealed that the tip of the blade was on the edge of my aorta, the main artery. And once that’s punctured, you’re drowned in your own blood; that’s the end of you. And I want to say tonight — I want to say tonight that I too am happy that I didn’t sneeze, because if I had sneezed, I wouldn’t have been around here in 1960, when students all over the South started sitting in at lunch counters. And I knew that as they were sitting in, they were really standing up for the best in the American dream and taking the whole nation back to those great wells of democracy which were dug deep by the Founding Fathers in the Declaration of Independence and the Constitution. If I had sneezed — if I had sneezed, I wouldn’t have been here in 1963, when the black people of Birmingham, Alabama, aroused the conscience of this nation and brought into being the Civil Rights Bill. And then I got into Memphis. And some began to say the threats or talk about the threats that were out, of what would happen to me from some of our sick white brothers. Well, I don’t know what will happen now. We’ve got some difficult days ahead. But it really doesn’t matter with me now, because I’ve been to the mountaintop. And I don’t mind. AMY GOODMAN: Dr. Martin Luther King. Within 24 hours, he would be dead, assassinated on the balcony of the Lorraine Motel April 4th, 1968. Today is the federal holiday that honors him.